A gamer who spent £13,700 on an island that exists only in a computer game has recouped his investment, according to the game developers. The 23-year-old gamer known as Deathifier made the money back in under a year. 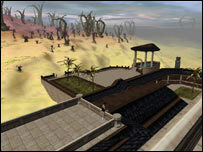 The virtual Treasure Island he bought existed within the online role-playing game Project Entropia. He made money by selling land to build virtual homes as well as taxing other gamers to hunt or mine on the island. Project Entropia offers gamers the chance to buy and sell virtual items using real cash, a trend which is gaining popularity as the boundaries between the virtual and real worlds continue to blur. 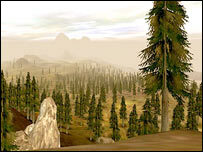 There are fortunes to be made in the burgeoning world of MMORPGs (massive multiplayer online role playing gaming). "The money made to date is only a taste of what can be achieved with my virtual island purchase," said Deathifier. "We've really only just begun with the estate sales and land management, there is still more room for growth and revenue with the untapped resources surrounding the land." Last month, another of Entropia's virtual properties - a virtual space station - sold at auction for £57,000. While the real housing market may be somewhat static, the one in the virtual world is booming, said the space station auction winner, gamer Jon Jacobs, AKA Neverdie. He said the virtual real estate market was "on fire" as gamers increasingly realised that virtual worlds could start to compete with real worlds at an economic level. Neverdie plans to use his space station to establish an in-game "night club" through which the entertainment industry can sell music and videos to gamers. The Entropia economy works by allowing gamers to exchange real currency for PED (Project Entropia Dollars) and back again into real money. Ten PEDs are the equivalent to one US dollar and gamers can earn cash by accumulating PEDs via the acquisition of goods, buildings and land. Project Entropia was launched in 2003 and now has 300,000 registered accounts.